On or about this day in 1944, Malka “Mala” Zimetbaum and Edward “Edek” Galinski were executed in the Auschwitz Concentration Camp after a failed escape attempt. Mala was 22 or 24; Edek was 20 or 21. 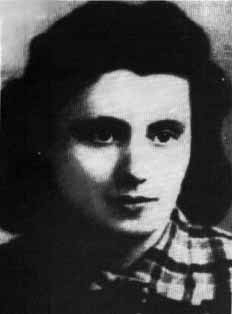 Mala, a Belgian Jew of Polish descent, had been living in Auschwitz for two years and had a privileged position because of her linguistic skill; she could speak about five languages and worked as an interpreter and courier. The staff trusted her and she had permission to go everywhere in camp. She often used her position to help the inmates. Mala fell in love with Edek Galinski, a Polish gentile prisoner. He was also a longtime inmate, having been in Auschwitz since 1940. He also had the freedom to go anywhere in the camp in his capacity as a mechanic. Sometime in the late spring or early summer of 1944, they escaped together. What they planned to do afterward is unclear; there are some stories that Mala carried documents from the camp and planned to tell the world what was happening there. How they were caught is also a bit of a mystery. According to some accounts, only one was arrested and the other went voluntarily so they could die together. Their subsequent executions have been the subject of legend, and lives large in many memoirs by survivors of the camp. Among those who wrote about it were Primo Levi, Sara Nomberg-Przytyk and Fania Fenelon. A witness, Raya Kagan, also testified about it at Adolf Eichmann‘s 1961 war crimes trial. All the accounts contradict each other; practically everything about the execution is disputed. Contrary to what the Wikipedia entry says as of this writing, we don’t even know whether it really took place on September 15; other dates have been suggested, including August 22. (Curiously, September 15 is also the date given for Mala’s arrival at Auschwitz in 1942.) Edek was apparently hung in the men’s camp, possibly alongside several other prisoners; Mala was executed in the women’s camp that same day. Edek supposedly tried to jump into the noose before the SS guard could finish reading his sentence, in defiance of protocol. His last words may have been “Long live Poland.” Everyone agrees that Mala slit her wrist with a hidden razor blade as she was standing before the crowd of woman prisoners waiting to be hanged. When the SS guards tried to intervene, she slapped one of them. They bound up her arm to keep her from bleeding to death. She may have been trampled to death at the execution site, but most accounts state the guards ordered some prisoners to cart her to the crematorium and throw her in alive. Several reports state that she either died on the way there, or was shot or poisoned by an SS guard who took pity on her. According to some accounts, Mala’s last words were directed at the guard she hit: “I shall die a heroine, but you shall die like a dog!” Others say she addressed the crowd of prisoners and told them liberation was in sight, or urged them to revolt. We will never know what her final words truly were, but their meaning is clear enough.